"The Art of McCartney" covers album gives new voice to the songwriter’s long and winding Beatles and solo catalog. Paul McCartney performs during a benefit concert at the Tobin Center, Wednesday, Oct. 1, 2014, in San Antonio. Bob Dylan concerts of recent years include a built-in guessing game that could be called, "What song is it anyway?" That's a product not only of a voice grown raspier with years but the still rambling troubadour's constant, restless rearrangement of his classic catalog. There's no guessing game to be played, though, on Dylan's relatively faithful rendering of "Things We Said Today," the great early Beatles deep cut he delivers on "The Art of McCartney," a double-CD tribute album due out Tuesday. There's no mistaking that it's "Thing We Said Today" and there's no mistaking that it's Dylan behind the mike. That's the art of an album in which a wide array of musicians gives distinctive voice to McCartney tunes, from the Beatles era to the ongoing solo years. But when it comes to the arrangements – or at least the tempos – the performers largely, well, let them be. That sounds, on the surface, like high-level karaoke. But the caliber of the lineup ensures individual artistry shines through. The years melt as Billy Joel growls "Maybe I'm Amazed" with a mix of awe and youthful urgency. Brian Wilson imbues the all-but-forgotten "Wanderlust" with a Beach Boys vocal lushness that transforms the by turns whimsical and wistful song into a sequel of sorts to "Sloop John B." Wings' "Bluebird" soars on the ethereal voice of Corinne Bailey Rae. Other pairings feel long overdue: Smokey Robinson improves on "So Bad," a tune that could have been written for The Miracles. Allen Toussaint gives "Lady Madonna" a righteous New Orleans thumping. Roger Daltrey ferociously tears through "Helter Skelter," a rocker McCartney wrote in response to The Who's high-volume, proto-metal sound. Toots Hibbert, along with Sly and Robbie, fire a reggae flare into "Come and Get it," and Booker T. Jones pumps Stax-style organ into “Can’t Buy Me Love.” But it's the two octogenarian artists who invoke elder statesman status to deviate most from the originals: Willie Nelson on "Yesterday," the most-covered song of all time, and B.B. King, who makes the bluesy McCartney obscurity "On the Way" his own. The largely faithful takes on the cuts are a tribute to songs ingrained in a pop culture consciousness shared by McCartney's contemporaries and younger artists who grew up on his music. But the album also is a stealth tribute to the Beatles’ ethos. 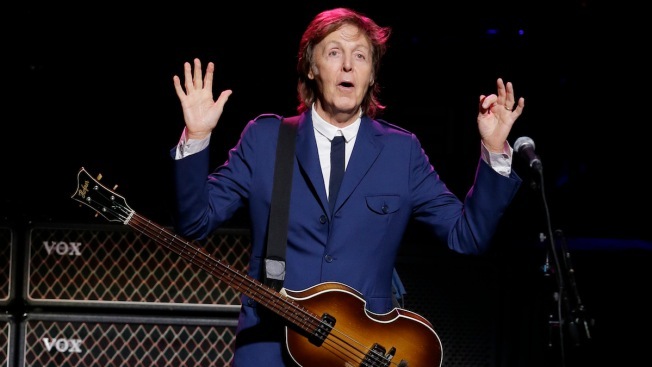 McCartney and his bandmates started out mimicking the rockers who influenced them – and, judging from the BBC radio sessions and early albums, they hewed closely to the original tracks (with notable exceptions, like the Isley Brothers' "Twist and Shout"). The Beatles paid respect to their idols – including Chuck Berry, Carl Perkins and Buddy Holly – by flattering through imitation. Still, John, Paul, George and Ringo breathed new life into songs like “Rock and Roll Music,” “Honey Don’t” and “Words of Love” – making them, in the ears of many, as much Beatles songs as the classics Lennon, McCartney and Harrison wrote themselves.